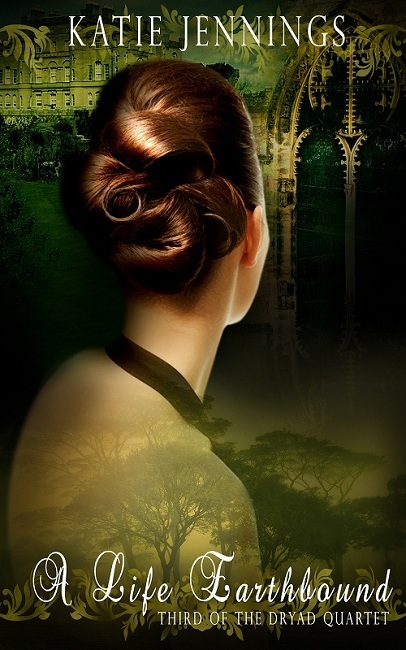 Over the next four weeks, I will be featuring and reviewing each book in Katie Jennings, Dryad Quartet series. Last week, I featured and reviewed Firefight in Darkness, the second book in the series. This week A Life Earthbound, the third book, is in the spotlight. The Dryad Quartet is a story of magic, elements, love, faults, and struggles as it follows the four Dryads that control Air, Fire, Earth, and Water as they work with Mother Earth to keep the world in balance. You will find muses, fates, and furies in their world and follow them as they move between Euphora and our world and try to stop a demon from destroying them all. Book three of the Dryad Quartet. I started A Life Earthbound, wondering what was going to happen next though I didn’t think I would like it. Rhia wasn’t a favorite character, in fact I rather disliked her going into this book. But I was pleasantly surprised. This book quickly became one of my favorites in this series and Rhia became one of my favorite characters. It has quite a few sad moments and there were many times I felt frustrated on behalf of Rhiannon. I just wanted to reach through the screen and smack some of the people in her life. Jennings did a great job of pulling me in to Rhia’s story and making me feel with her even as Rhia built walls to protect her heart from feeling too much. The only disappointment I found in this book was in exploring Rhia’s past, Jennings didn’t show Capri’s return. I would have loved to have been inside Rhia’s head and feelings when she laid eyes on the friend she so dearly loved for the first time in fifteen years. That said, this book still gets a five star. Jennings did such a good job of building Rhia and showing us her motivations. Like Capri, Rhia’s emotions and actions fit the situations perfectly. Some people didn’t like the exploration of Rhia’s past, the story begins before Capri was taken. However, I loved this aspect of it. I don’t think I could have understood Rhia and her motivations as well without going back and seeing what happened to her as a child. Because of that knowledge, I was able to empathize with Rhia later and understand her reserve and the cool distance she kept from everyone. I went from thinking Rhia was a stuck up and cold person (Breath of Air and Firefight in Darkness) to understanding how deeply she was hurting and how afraid she was to love anyone. Kudos to Jennings for taking a character I didn’t like and making me love her. Watch for the review of the final book in this series next week.